It’s the start of another month, the days are getting shorter, the nights are chillier and we’re starting to feel the beginning of winter. But that’s no reason to stay at home all month! This April there are some incredible events to get you outside, active, dancing and supporting some amazing causes. We are extra excited this month, because we are presenting our own event for teens with our friends over at Ramona Magazine, Code Like A Girl and Also Presents! This salon dinner is going to be an absolute highlight of the month, so make sure you check it out. We can’t wait to see you there! Our friends over at Ramona Magazine and Also Presents have put together this amazing event for young people with periods. A full day of workshops designed to help folks figure out the their menstrual cycle, it’s perfect for the young uterus-owner in your life! Activities include creating self-care cards, creative writing exercises, budgeting and organisational workshops, pilates to help with your cycle and so much more! You can buy tickets to this fantastic event here. Wednesday 10th - Rally to Change the Rules! We’ve got an election coming up, and it’s time to get out there and show our politicians what we care about! We Are Union are holding a rally at Trades Hall to protest the Liberal Government’s wage cuts, privatisation schemes, funding cuts to schools and more. Everyone deserves a fair wage, decent working conditions and fully funded public services. For more info, head to We Are Union’s website. We’re back with another event! 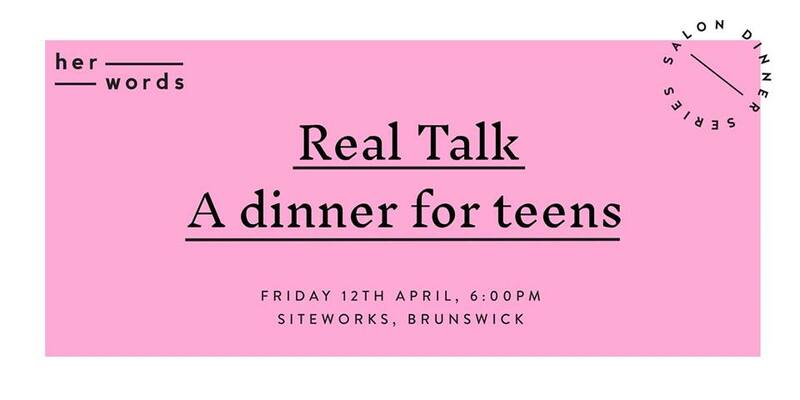 This time we are super excited to be teaming up with Ramona Magazine, Code Like A Girl and Also Presents to bring you a fun and inspiring salon-style dinner for non-binary youth and girls. The amazing Ella Mittas will be creating a delicious meal for you all, and her words founder Domini Marshall and Ella will be holding a Q&A with another guest speaker - keep an eye out for our guest announcement! You’ll also have the opportunity to ask your own questions about growing up, finding your passion and the lessons you’ve learnt, plus you’ll walk away with a few gifts and goodies too! We are so excited to be holding this amazing event, so let the young folks in your life know and book tickets here. Join an amazing lineup of creatives and artists for a night of spoken word, art and music supporting gender equality and the prevention of domestic violence. Featuring Eleonora Arosio Frances Cannon, Madison Griffiths and many more, funds from this event go towards fEMPOWER, an organisation facilitating school-based workshops on how to recognise and challenge gender inequality. This organisation offers an essential opportunity for domestic violence prevention through education and this promises to be an amazing evening in support of such a worthy cause. For more info, head to the event page. Summer dreaming is a party is a female-led, alcohol-free music festival, all about celebrating the creative talents of Melbourne's Inner North. There will be an amazing lineup of female and gender non-conforming musicians and DJs, including On Diamond, Chitra, Nightlight and SHELL LEY. Plus, there will be a workshop from Big Feminist Sing, plus zine-making, meditation, Zumba and more! Head to their event page for all the details. Got room in your schedule for another party? Of course you do! Held at the iconic Gasometer Hotel, SWARMFEST is a celebration of women, queer people, femmes, trans and non binary artists who have made strides within the local music scene. Featuring a lineup including SaD, Kt spit, Racerage and more, it’s going to be an amazing night of dancing, drinking and supporting babes in the music business. Head to their event page for the full lineup and more details. Our International Women's Day Panel - On burnout, mental health and self care.